Chesterfield defeated neighbours Sheffield United 3-2 as both sides had a man sent off in an eventful match. Jimmy Ryan hit a 25-yard opener for the Spireites just before Blades striker Michael Higdon was sent off for a dangerous tackle on Daniel Jones. 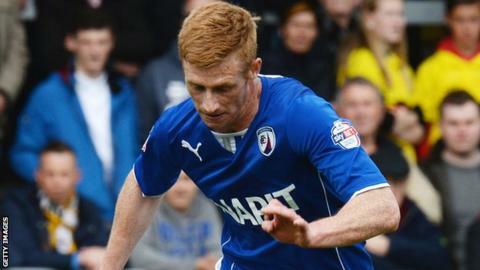 Chesterfield keeper Tommy Lee saw red for bringing down Ryan Flynn, before Gary Roberts doubled the hosts' lead. Eoin Doyle made it 3-0 with 18 minutes to go before Marc McNulty and Neill Collins set up a tense finish. Former Hibernian striker Doyle has now scored 13 goals in 11 games for Chesterfield this season, including a run of nine goals in the last six matches. "It's not a big victory, it's just a victory. You don't have big victories, that's for you media people to build up. "What you can do well these days is build up pressure on managers. We've just got three points. "Today is a great day for us, to beat a team as established as Sheffield United is great for us. "Today is our day, we'll enjoy it. And we're show Sheffield United the respect they deserve." "Decisions changed the game. One or two of our decisions but mainly from the officials. "I thought Michael Higdon's sending off in the context of the game was a yellow card. "I thought the turning point was on about 20 minutes when Jamie Murphy got brought down one-on-one with the keeper. "I thought we did enough to get back into it. There were one or two offside decisions that didn't go our way." Match ends, Chesterfield 3, Sheffield United 2. Second Half ends, Chesterfield 3, Sheffield United 2. Corner, Sheffield United. Conceded by Sam Clucas. Goal! Chesterfield 3, Sheffield United 2. Neill Collins (Sheffield United) header from the centre of the box to the bottom left corner. Assisted by Jamal Campbell-Ryce. Daniel Jones (Chesterfield) is shown the yellow card. Georg Margreitter (Chesterfield) wins a free kick in the defensive half. Attempt blocked. Neill Collins (Sheffield United) right footed shot from the centre of the box is blocked. Corner, Sheffield United. Conceded by Daniel Jones. Attempt saved. Sam Morsy (Chesterfield) right footed shot from outside the box is saved in the centre of the goal. Goal! Chesterfield 3, Sheffield United 1. Marc McNulty (Sheffield United) right footed shot from the centre of the box to the centre of the goal. Substitution, Chesterfield. Armand Gnanduillet replaces Eoin Doyle. Corner, Sheffield United. Conceded by Ian Evatt. Goal! Chesterfield 3, Sheffield United 0. Eoin Doyle (Chesterfield) right footed shot from the centre of the box to the bottom left corner. Assisted by Daniel Johnson. Attempt missed. Jimmy Ryan (Chesterfield) right footed shot from the right side of the box is just a bit too high. Substitution, Sheffield United. Robert Harris replaces Jay McEveley. Substitution, Chesterfield. Sam Clucas replaces Gary Roberts. Substitution, Sheffield United. Jamal Campbell-Ryce replaces Ryan Flynn. Attempt missed. Sam Morsy (Chesterfield) right footed shot from outside the box is close, but misses to the right. Attempt blocked. Patrick McCarthy (Sheffield United) right footed shot from more than 35 yards is blocked. Substitution, Sheffield United. Marc McNulty replaces James Wallace. Second Half begins Chesterfield 2, Sheffield United 0. First Half ends, Chesterfield 2, Sheffield United 0. Patrick McCarthy (Sheffield United) wins a free kick in the attacking half. Attempt missed. Patrick McCarthy (Sheffield United) header from the centre of the box is close, but misses to the left. Ryan Flynn (Sheffield United) wins a free kick on the right wing. Goal! Chesterfield 2, Sheffield United 0. Gary Roberts (Chesterfield) left footed shot from the left side of the box to the bottom right corner. Substitution, Chesterfield. Myles Wright replaces Jay O'Shea. Thomas Lee (Chesterfield) is shown the red card for a bad foul. Foul by Thomas Lee (Chesterfield).